This edition of the very highly peated Octomore line from Bruichladdich tops out at a peating level of 167 ppm–though, as always, this is a number measured before distillation and the peat levels in the spirit that makes it into the bottle are not anywhere close to that level or even proportionately higher than malts made from barley with a lower peat ppm count before distillation. At any rate, I enjoyed my bottles of both the 2.1 and the 4.2 (Comus) and didn’t find those to be insanely peated in the glass. Ditto for the 3.1, which I got a taste of at a gathering in March (though I didn’t like it quite as much as the 2.1 or 4.2). Let’s see what the story is with the 6.1 which is also distinguished in that it’s made from Scottish barley. Nose: Peat, slightly rubbery and quite sweet. Gets very phenolic very fast and also rather briny–both salty sea air and olive brine. Some oily, almondy notes below all that and some vanilla and cream that begins to come to the fore. With more time and air there’s lemon as well, salty and ashy. With even more time there’s a butyric note. I wonder if water will expand or banish it. Okay, good: water does push it down and brings out more of the salted lemons. Palate: Starts out sweet and mild for a half-second and then there’s a big peaty wallop as the sweetness takes a sharp turn into tar and smoke. The sweetness never goes away though and the peat/smoke is not over the top. On the second sip there’s even more vanilla sweetness along with the bitter smoke. Gets ashier as it goes, but stays sweet. With water there’s more acid and better balance (the smoke gets less acrid/bitter). Finish: Long. The sweetness lingers along with the smoke. Some lemon emerges too and the smoke gets more tarry. As on the palate, water dials back the tar. Comments: This is well balanced (especially with water) and the interplay between the vanilla/sweetness and the heavy smoke is very nice. While it’s not raw by any means there’s no complexity either though and nothing to particularly recommend it over most of its heavily peated Islay brethren (or the earlier versions which I liked a lot more). It’s certainly hard to recommend at the price. You’re better off buying one each of the Caol Ila 12, Ardbeg 10 and Laphroaig 10 CS. This entry was posted in -Whisky by Rating, 85-89 points, Bruichladdich, Octomore. Bookmark the permalink. ← A Little Housekeeping: Whisky Links etc. I’ve been thinking about this whisky more since drinking it and writing the review last night. Specifically, I’ve been wondering if I gave it a slightly lower score than I otherwise might have not because of anything to do with the whisky per se but because I’m increasingly jaded about the premise of this series: very highly peated whisky at a high strength. Okay, so what? What does each new iteration bring to the table? They’re not any older than previous editions–other than the one-off (?) Octomore 10 these are all 5 years old–and the incremental raising of peat levels doesn’t seem to me to be doing very much in and of itself. Of the .1 releases (the ones not finished in wine casks) the 2.1 seems to me to be the best of the ones I’ve had, and it may not be a coincidence that its peating level was lower (140 ppm). I think Bruichladdich might want to abandon the peat arms race, give up on peat for peat’s sake and instead ask what the best highly peated whisky they could make might be, and not simply how highly peated the peatiest whisky they could make might be. Nice review and post. The selling point is, of course, that this IS the peatiest thing going but, as you point out, it might ultimately be self-defeating – sort of “OK, peaty to the nth… so what, does that make it good?”. Your question of “what does each new iteration bring to the table?” is VERY interesting, both as applied here, but also as applied to many other whiskies issued in “Editions I, II, II, IV…” in general, say Tempest for example. ABV and ppm might be slightly different from the last one or the next one, and people can claim to taste the difference, but are they fundamentally different whiskies – or SO fundamentally different so as to justify all the hoopla; “I’ve just GOT to get the latest one” vs. “been there, done that”. Where formulation (say, with vatted products such as The Peat Monster) and finish isn’t really being radically altered, what IS the big deal? The products are new, technically ever-so-slightly different, but are they improved and DO I need to “taste for myself”? From a marketing standpoint, of course, it makes complete sense for them to keep churning out the most “extreme” peated whisky there is. Given the price I’m sure margins are high and they don’t need to sell them all out right away. And you’re not going to go broke or lose friends in these peat-obsessed times (I should talk) by being the distillery that makes the most highly peated whisky. That said, I think the Octomores are probably more different from each other than the various Laph 10 CS, Bowmore Tempests, Springbank 12 CS, A’bunadhs etc.. And they should be as there actually are differences in the production process: peating levels, in this case the type of barley, wine casks in the case of the .2 releases. 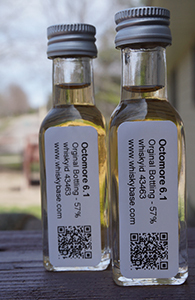 I think my point is more that the .1 versions don’t seem to be yielding very interesting results at this point and they may as well stabilize a regular Octomore at a lower (but still high) peating level and continue cask type variations (as Edradour does with Ballechin) as the annual releases. But they seem to be locked into a “go ever higher” mindset. From their point of view, I suppose, this is an experimental series, which is fine; it’s just that I don’t see any point for regular drinkers, certainly not for me, to keep up with it. However, if they were to put out much larger quantities of something closer to the 2.1 at a lower price I’d be much more likely to be a repeat customer. Plenty of reasonable people would probably disagree though. So, the 6 series represents a small step down from the 5.1’s high mark. How much are you paying for this? I know in Alberta there are limited quantities available for the equivalent of $129 US, while you could easily spend over $200 trying to get the three alternative malts. I only purchased samples. But as per Winesearcher this is going for anywhere between $159 and $259 in the US. Which makes me think that I might be getting a heck of a deal, even KL has it for $200. Based on what you and others have said, it might just be worth it, especially compares to most Canadian prices. Did you pull the trigger? Do report your impressions of it if you did.